The Coast to Coast walk is one of the most popular walks in the world. At approximately 183 miles it passes through three National Parks; the Lake District, the Yorkshire Dales, the North Yorkshire Moors and links the Irish Sea to the North Sea, via the hills, moors, and valleys of northern England. From our parking facility in Kirkby Malham to St Bees, and return to Kirkby Malham from Robin Hoods Bay. The Coast to Coast walk is one of the most popular in the country, passing through the three National Parks of the Lake District, the Yorkshire Dales, and the North York Moors, linking the Irish Sea and the North Sea via the hills, moors and valleys of northern England. The route is traditionally walked from west to east (St. Bees to Robin Hoods’ Bay) so that the prevailing winds and weather are coming from behind, and most guide books describe it this way. Along the route are many places of interest, including ancient castles, medieval abbeys, and picturesque villages, and the walk constantly offers a variety of scenery and terrain. However, whilst it is fairly easy to follow through the National Parks, it is not an official National Trail, and is not generally waymarked. The valleys through the middle section, and the arable land in the eastern section make for straightforward walking, but the hills of the Lake District and the Yorkshire Dales are high, and gradients can be steep, so before you embark on this walk, you should be physically fit, and fully equipped to meet it. Unless you are an experienced long-distance walker, it is advisable to take a companion, your boots should be well broken-in, and that you are able to carry a rucksack with your waterproofs and other requisites for the day. The route attracts thousands of walkers each year, but a few fail to complete the walk, usually because fitness and stamina have been underestimated, and the weight of personal belongings required, has been overestimated! The assistance of Brigantes Baggage Courier Service has helped hundreds of walkers to achieve the completion of the walk, whilst at the same time enjoying the experience, the scenery, and their hard-earned holiday, without the disadvantage of having to carry a heavy back-pack, and knowing that warm, dry clothing awaits them at the end of each day. Be prepared for the rigours of hill-walking, carrying warm, and wet weather clothing as a necessity, as well as sufficient food and drink, since this is not available to purchase over many sections of the walk, once you have started out for the day. Just a quick note to thank you for your efficient service to Carole and I while we were doing the Coast to Coast Walk. As we have found on other holidays with Brigantes, you were there when we needed you but we never felt we were being ‘supervised’! Your choice of accommodation for us was excellent and our bags were always waiting for us. We had a great time and would have no hesitation in recommending Brigantes to anyone wanting to do the C2C ! We recently completed the Coast to Coast walk using your booking and baggage transfer services. We we’re very pleased with the organisation, advice and smooth service you provided, it made our trip easy and stress free and we would recommend you to others. Wanted to thank you and all others involved in organising Coast to Coast for John and myself. Everything worked very well, and the Coast to Coast experience was indeed brilliant. Would certainly recommend Brigantes. Hard to believe we finished the coast to coast a week ago! Just wanted to thank you for superb organisation, we had a really great time Annette and it was made easy by you all at Brigantes! 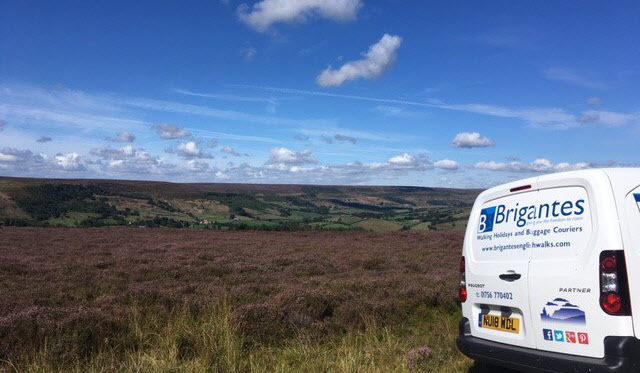 We started well with the very kind hearted Terry doing a super job of getting us from RBH to Reeth and then our bags and dog food moved seamlessly along the route without us having to worry about it once. The B and Bs you organised for us were all good but some were exceptionally so. All in all an excellent holiday and we cannot wait to do the next one and hope you will be able to help us out again. We want to do some more walking in the Lakes and we fancy the short St Cuthberts Way too, not sure if that is in your area but hope so! It was interesting listening to the other Coasters experiences and we can definitely say we would (and have! )recommend you to anyone, your flexibility, friendliness and care for baggage and customers makes Brigantes a winner in our eyes. Just hoping that the caravan will be back on the road some point as that was our favourite of course! I am back in New Zealand after 2.5 months holidays. One of the highlights of the trip is the Coast to Coast Walk – thank you so much for organising all the accommodation, baggage collections and always answer my questions so promptly. I love the walk and have met some really great people. Just had to drop you an email to say what a great service you provided. You did what it said on the tin and more. Ok so all our bags went to all the correct destinations – that’s only to be expected. However when one of our number broke her foot but wanted to tag along for the rest of the us walkers your couriers provided a lift with the bags over several days at no extra cost – superb. I cannot recall all the courier’s names but thanks to Stuart, Mark, Bob and all the others, please pass on my regards and thanks. Brigantes seems to be the only business prepared to take on East to West Coast to Coasters so all power to you. This is my second C to C I’ve organised for a group, I do other walks for groups that are usually from one base and I really appreciate the service you provided.